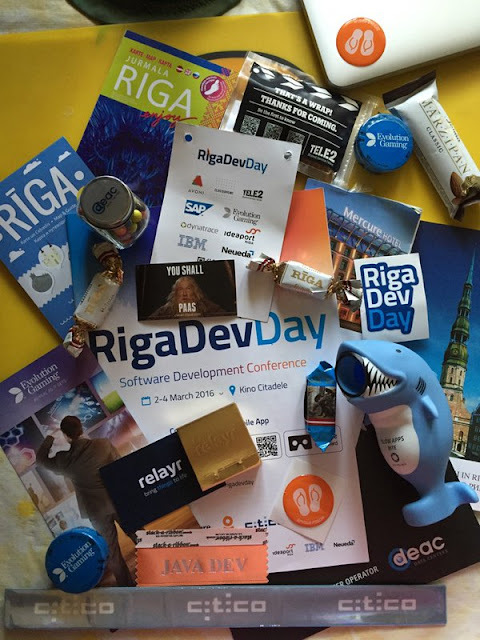 Recently I had a chance to attend Riga Dev Day. This is an up-and-coming Java conference in the capital of Latvia, which is a high-key and at the same time poise place. Riga Dev Day has been held only since 2014 but its level of organization and interestingness was above my expectations. The talks took place in the first two days, and the last day was devoted to master classes. There were many sponsor companies, and each advertised their products and wanted to hire more workers. Therefore, in case you want a nice job but are not sure which company to apply then just check out the sponsors. With high probability, you will find something neat for yourself. What I personally liked the most is the IoT stuff (Arduino Company). As I envision this, it’s the part of houses of the future. The company cooperates with Bosh and tries to pave the way to reliable and cheap control systems for our belongings through Wi-Fi or Bluetooth. Currently they work on controlling the state of the washing machine by taking information from its electronic parts, which is a thin end of the wedge. As a result, they will have a program to give advice on which parts need updating, cleaning, or replacing, and when. After they’re done with the washing machine, they will put the chips in other devices produced by Bosh, and so make the communication between your belongings and yourself possible. I have never seen a living IBM employee so for sure I staked to come to the stand. They proposed Bluemix—a server for web apps in different languages. Java, Python, JS, and many others are included, but no Kotlin for now. Accenture is one of the biggest Latvian companies, which might be the reason why they gave the most generous presents to the participants. In order to participate in the lottery, one had to put the filled form in a little carton cube. The cube was then placed into a big box. The curious this is that the box was placed by a wooden robot-excavator on remote control. That was big fun. There were way too many buttons to navigate robot parts. You always get the feeling that the company cares a lot about its employees if it proposes something interesting you’ve got to handle to win the price. The picture with the companies’ names is attached below so you may check on your own what others do/produce. I believe that none of them is are dubious. Another thing I cared about was Ukrainians presenting some of the companies. Some of them work in Latvia, others are just Ukrainian partners that came to present the product. It was interesting to talk to them and hear out their opinions about working with the Latvians. Obviously, sponsors are not the only thing you’d come to the conference for. Please check below some talks that might interest you. Java 9 by Dalibor Topic—a general overview of the new features. The talk was about the changes brought to the language of the L size (impacts everyone), M size (you might come across like default garbage collector), and S size (you might stumble upon only in very limited cases). Also, I have learnt the basics of Kotlin thanks to the talk by Svetlana Isakova, its developer. She really tried to make everyone follow what she was presenting, and, it seems, achieved the goal. The speaker who gets my other prize for an interesting talk is David Dalabassee with his news about the Web Front. He spoke a lot about parsing JSON, which is exactly what’s being used at my project. To sum up, everyone at the conference was open-minded, easy-going, and just outstanding. I have got many positive impressions about the talks, the people, and the city, so be sure to come the next year and feel that for yourself.